Charities Aid Foundation (CAF), in support of the World Giving Index for 2014, conducted by International research firm. 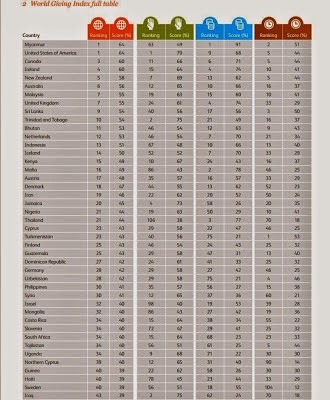 Gallup has ranked Nigerians 2nd in Africa and 21st most generous people on earth. Myanmar ranks No 1 followed by United States of America, Canada, Ireland, New Zealand, Austrialia in that order.